Hurricane Michael is closing in on the Florida panhandle this morning. At 9 a.m. CDT, Time, the category 4, extremely dangerous storm with 145 mph is 65 miles SSW of Panama City, Florida, 70 miles WSW of Appalachicola, Florida—moving north at 13 mph. The eye of the hurricane is forecast to move over land later today. Many have left the area to get out of the storm’s path. 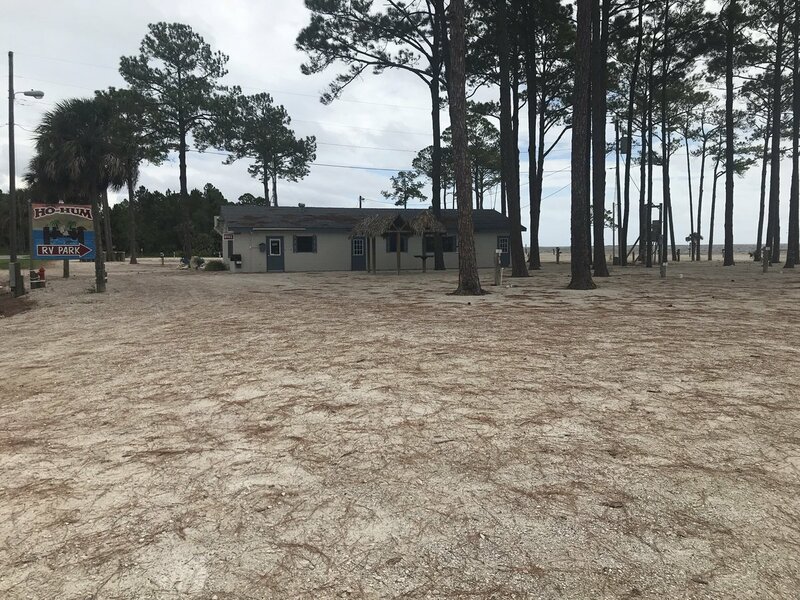 Ho-Hum RV park in Carrabelle, Florida is empty Tuesday as Hurricane Michael churns toward Florida panhandle. Carrabelle is in Franklin County along Florida’s panhandle and east Apalachicola. Photo Courtesy: Stephen Jiwanmall, WTXL-TV in Tallahassee. “EVERY FAMILY must be prepared. 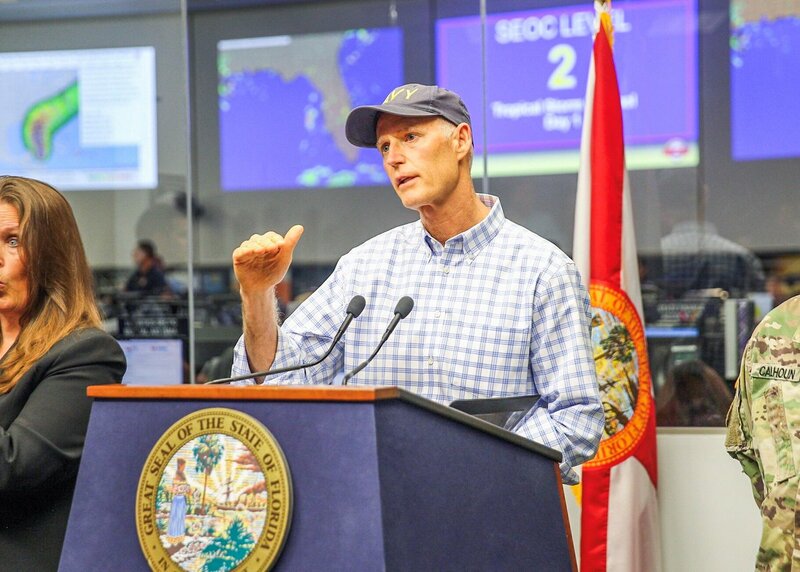 We can rebuild your home, but we cannot rebuild your life,” Governor Scott tweeted Monday morning. Governor Scott tweeted Tuesday he has 2,500 Florida National Guard ready and the Florida Highway Patrol is making nearly 350 troopers available for deployment. Scott says this storm will be devastating. Stay tuned to local stations, weather channels, newspapers, national news broadcasts, NHC, NWS, local and state emergency officials social media for more updates on Hurricane Michael. At 700 AM CDT (1200 UTC), the eye of Hurricane Michael was located near latitude 29.0 North, longitude 86.3 West. Michael is moving toward the north near 13 mph (20 km/h). A turn toward the north- northeast is expected later this morning, with a turn toward the northeast expected this afternoon or tonight. A motion toward the northeast at a faster forward speed is forecast on Thursday and Friday. On the forecast track, the eye of Michael is expected to move ashore over the Florida Panhandle later today, move northeastward across the southeastern United States tonight and Thursday, and then move off the Mid-Atlantic coast away from the United States on Friday. Reports from an Air Force Reserve Hurricane Hunter aircraft indicate that maximum sustained winds have increased to near 145 mph (230 km/h) with higher gusts. Michael is an extremely dangerous category 4 hurricane on the Saffir-Simpson Hurricane Wind Scale. Some additional strengthening is possible before landfall. After landfall, Michael should weaken as it crosses the southeastern United States. Hurricane-force winds extend outward up to 45 miles (75 km) from the center and tropical-storm-force winds extend outward up to 185 miles (295 km). A wind gust to 56 mph (91 km/h) was recently reported at Apalachicola Regional Airport. The estimated minimum central pressure based on NOAA and Air Force Reserve Hunter aircraft data is 933 mb (27.55 inches). RAINFALL: Michael is expected to produce the following rainfall amounts through Friday… Florida Panhandle and Big Bend, southeast Alabama, and portions of southwest and central Georgia…4 to 8 inches, with isolated maximum amounts of 12 inches. This rainfall could lead to life-threatening flash floods. The remainder of Georgia, the Carolinas, and southern Virginia…3 to 6 inches, with isolated maximum amounts of 8 inches. This rainfall could lead to life-threatening flash floods. Florida Peninsula, eastern Mid Atlantic, southern New England coast…1-3 inches. SURF: Swells generated by Michael will affect the coasts of the eastern, northern, and western Gulf of Mexico during the next day or so. These swells are likely to cause life-threatening surf and rip current conditions. Please consult products from your local weather office. TORNADOES: A few tornadoes will be possible across parts of the Florida Panhandle and the northern Florida Peninsula through this afternoon. This risk will spread into parts of central and southern Georgia and southern South Carolina this afternoon and tonight. This entry was posted in Asian Community Alert, Florida News, Florida Tourism, Florida Travel, Hurricane Preparation, Hurricane Season, National News, Weather, Weather Alert and tagged Michael headed to Florida, T.S. Michael Florida. Bookmark the permalink.